Why visit La Paz Mexico ??? La Paz is the capital of Baja Sur with a population of around 200,000. It is a traditional Mexican city . . . a port city with fishing as its main industry which has managed to escape becoming one of Baja Sur's americanized tourist destinations. The upside is that the lack of popularity makes it a nice break from the "same thing, different place" resorts and a great place to find hotels at bargain prices. Well . . . for now anyway. La Paz currently has an 18 hole golf course, a 1,700 acre resort and large new aquarium under construction. That and the more frequent stops by cruise ships signal the beginning of changes under the sign, "coming soon". The current state of the "Tourist Zone" consists of the Malecon. More than just a sea wall, the Malecon is lined with a sidewalk and parks for strolling and socializing. 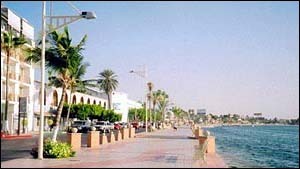 On the southwest end of the Malecon is the Marina La Paz where cafes line the walk way and an ever growing number of condominiums and vacation homes are constantly being built. If you need more reasons than that . . . La Paz may not be the best choice for your vacation. Though we do offer plenty of information on other destinations in Mexico . . . So take a look and explore your options before making a decision.